This slide is the inspiration for this blog post. 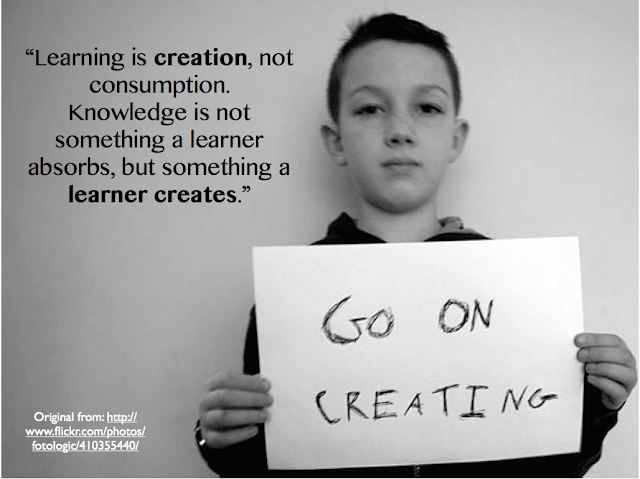 I personally, have been on a crusade to let my students create rather than spoon feed them content. I want them to play with the information I give them, I went them to feel a sense of ownership of the knowledge and I want them to create something using the knowledge I have given them. An ongoing theme in my classroom is to make your learning visible. 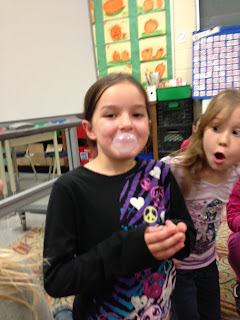 My students are in grade 1 and 2, and they already know that they have a huge audience on their personal blogs. We talk about who and why they are creating videos about the content we are learning in class. My students want to teach other students and peers about what they are learning about. It is also a great assessment piece for me, however, they don't see me as their audience anymore. My students now feel a sense of accomplishment and purpose for what they are doing. I'm sure they always did, however not to this magnitude. Here is a screen shot of the most popular content creation apps we are currently using in my classroom. I was going to write a brief summary of each app, but then I realized that you can easily read a summary on the internet. Instead, I will try to link a student created piece from my grade 1/2 classroom to the top 10 most used content creation apps we use. 3. Educreations - Here is a video of a math assessment my students did on time. They were given a cue card with different times written on it and had to create a video on Educreations showing their learning of time. 5. Explain Everything - This is a video using the Explain Everything app from our Procedural Writing Unit. 6. 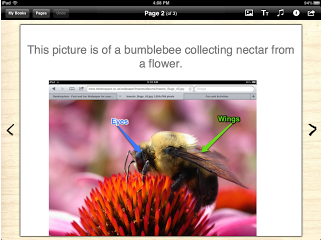 ShowMe - In this video a student is teaching others about patterning. 7. 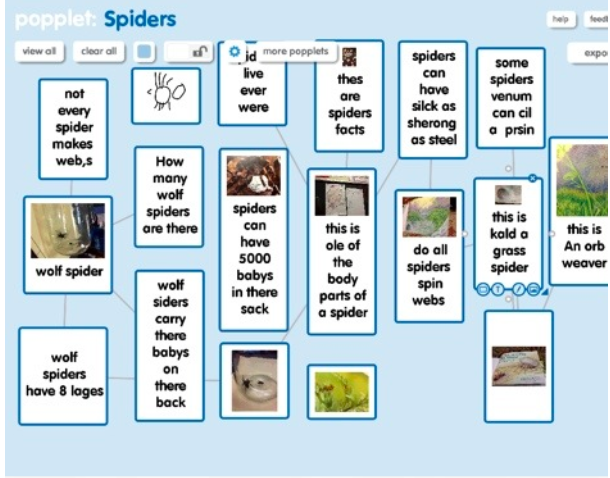 Popplet - This is a screen shot of one of my grade 1's popplets. He was showing his learning about spiders. 9. Book Creator - We love using this app, however there is no embed option, so we can see the pictures on a blog but you can't hear the audio. We are hoping for an update to make this app even more wonderful! Here is a picture from one of our Non Fiction Insect Books . 8. LittleBirdTales - We just completed our Personal Narratives on the LittleBirdTales App. We will definitely be using this app again in the near future. Here is a link to one of my students personal narratives on their blogs. 10. ScribblePress - Here is a book written by a couple of my students about school Scribble Press. 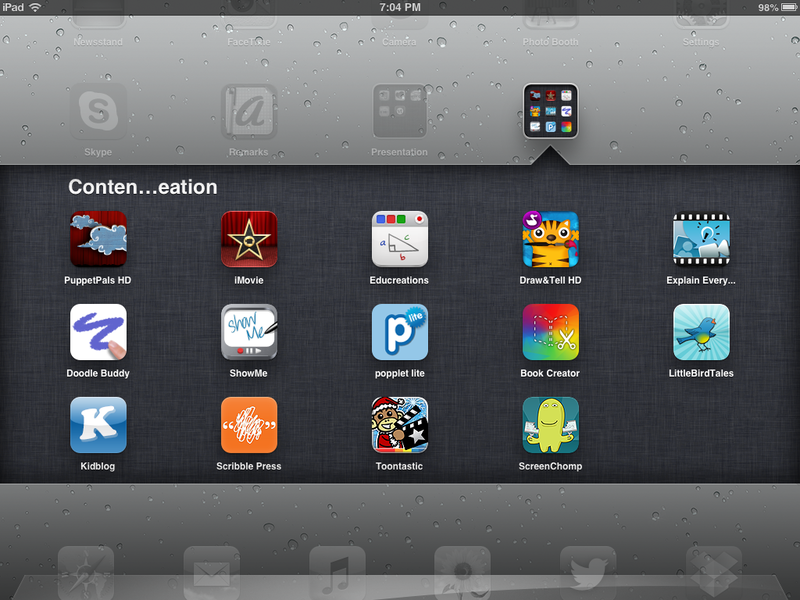 These are only a sample of things that we have done with these apps. I hope that this post has ignited your creative juices and you are thinking of how you could use some of these content creation apps in your classroom. I would love to hear what kind of things you are creating in your classroom! Last week we began our Procedural Writing Unit. We began the unit immersing the students with different procedural books. Students went on a hunt in our room for procedural texts and they found them in many of the books they had in their book boxes. We also brainstormed procedural writing topics. The students came up with so many things to write about! One of the activities Mrs. Pelletier and I did with the students to show the purpose and how to model how to write a procedural text was a science experiment. We performed the experiment in front of the class and then the students and I wrote out the materials and steps we performed. Students took pictures of the steps and then imported the pictures into Explain Everything. Students then recorded their voices explaining the experiment. Here is the finished product. 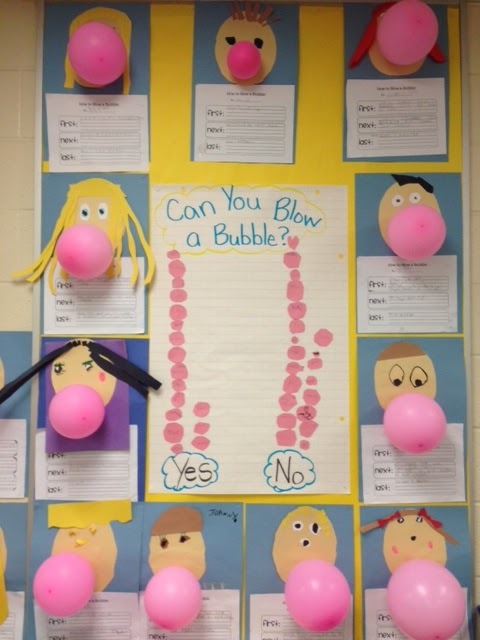 The second Procedural writing activity was to have the students blow a bubble and then write the steps to blowing a bubble. If you are interested in doing this activity, you can download it for free here. Students were given a piece of Hubba Bubba to chew and then were asked to blow a bubble, thinking of the steps they performed while blowing the bubble. 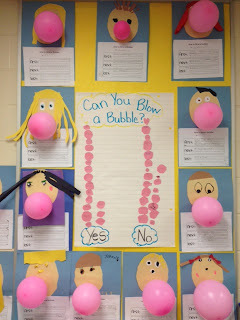 Students then wrote their procedure down, created a face that looked like them and blew a pink balloon up to insert where the mouth should be. The kids loved the lesson and the overall project turned out really cute! In our third project, we read the Gingerbread Baby. Students were then given gingerbread cookies and a picture of a gingerbread man. Students were instructed to eat the gingerbread cookie and to take notes on the picture of the gingerbread man according to the order they ate the gingerbread man. 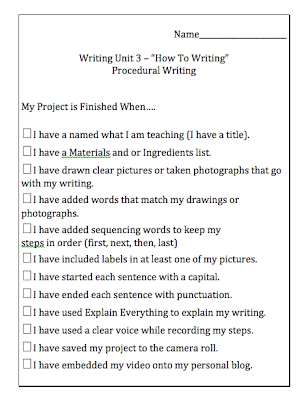 Students then wrote their procedure for "How To Eat A Gingerbread Cookie" Tomorrow, the students who have completed the writing assignment will be given another gingerbread cookie to take pictures of it for their video. Then, the students will import the pictures into explain everything, explain their procedure using their writing assignment and post their final product on their blogs. 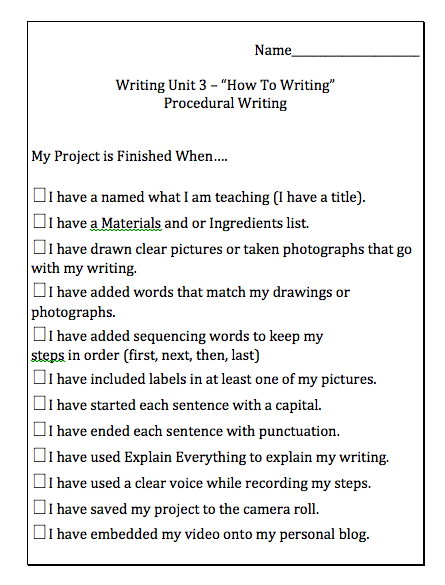 (Using the Science Experiment video as a guide) I have taken a screenshot of the success criteria checklist I created for this particular project. *As I am writing this post student's are still working on this project. I will update when they have completed their videos and have uploaded them to their blogs.